In case you haven’t heard, the Blue Oval is getting ready to replace its “Ford Fusion” race car in NASCAR’s Monster Energy Cup Series, making the iconic Mustang the face of its top-level NASCAR competition car for the first time ever. Like the rest of Ford’s traditional sedan lineup, the Fusion is set to exit the North American market soon enough, leaving the Mustang as the only reasonable choice for Ford’s NASCAR race cars moving forward. Ford’s new NASCAR Mustang will make its racing debut at Daytona on February 17th, 2019. But Ford isn’t alone in changing up its official NASCAR designs. 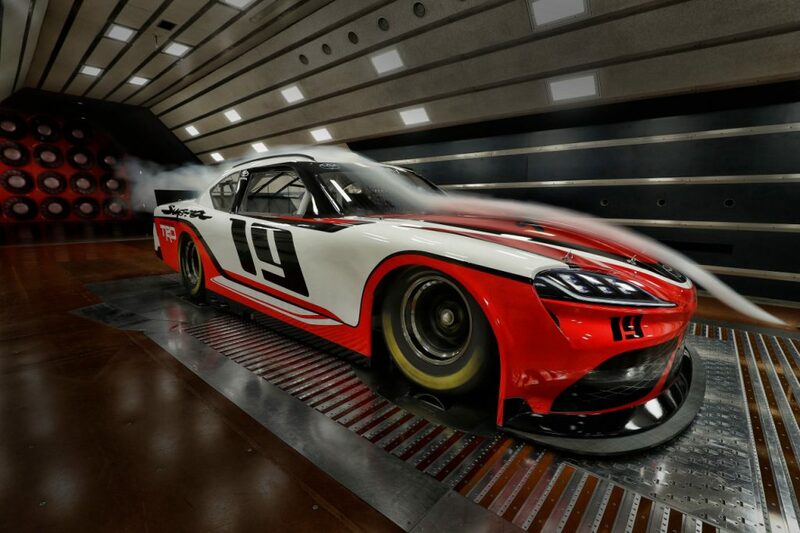 This year, Chevrolet replaced its SS in the Monster Energy NASCAR Cup series with a stock car whose design is based on the sixth-generation Camaro, and the pivot from family sedans to bona fide sportscars in NASCAR continues with this: the brand-new Toyota Supra stock car. Toyota unveiled the design earlier this week, announcing that it will start racing in the NASCAR Xfinity Series next season. A brand-new production version of the Toyota Supra, with looks akin to those of the Japanese automaker’s FT-1 concept of 2014, is set to be revealed very soon. It’s expected to go on sale as a 2019 model-year vehicle. Bear in mind that Toyota has announced its new Supra stock car for the Xfinity Series only; in the top-spec Monster Energy NASCAR Cup Series, the company’s existing Camry stock car design will stick around for now. But in the lower-spec series, the Toyota Supra will compete against the Ford Mustang – Ford’s Xfinity Series design since 2011 – and Chevrolet Camaro. Of course, we can’t expect the 2019 NASCAR Xfinity Series to give us an accurate representation of what an actual Mustang-v-Supra skirmish will look like; NASCAR race cars bear precious little in common with their road-going counterparts, having high-revving, purpose-built V8 racing engines and tubular-frame chassis. For that, we’ll have to wait around for a true, honest-to-goodness comparison test.